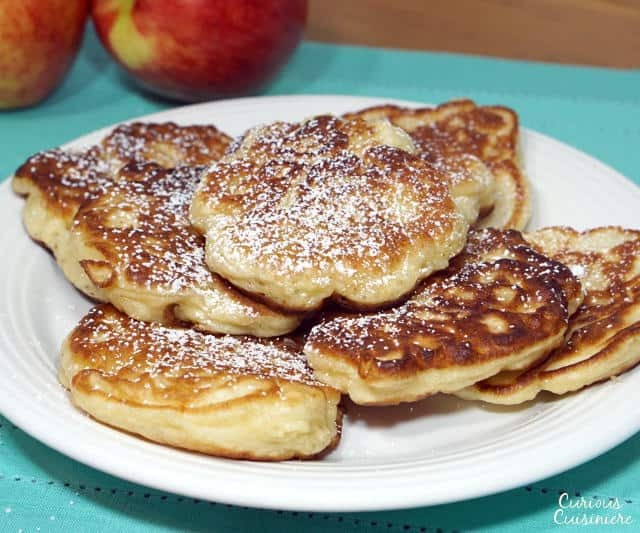 Crispy on the outside, sweet and fluffy on the inside, these Polish Apple Pancakes are sure to become a favorite fall treat! 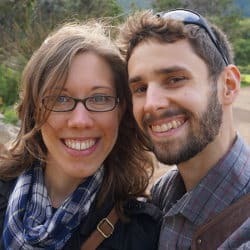 When we first stepped off of the plane in Poland, we were hit with major language shock. I know French and Tim knows enough German to get us by, so in any Latin or German-based languages we’re at least comfortable enough with the sounds, and can do a decent job making our way around. The letters looked (mostly) familiar, but the way they were put together and the sounds that we heard turned our idea of pronunciations on its head. By the end of our few weeks in Poland, we were just starting to wrap our mind around some of the sounds and letter combos. So, let’s get this pronunciation thing out of the way first. 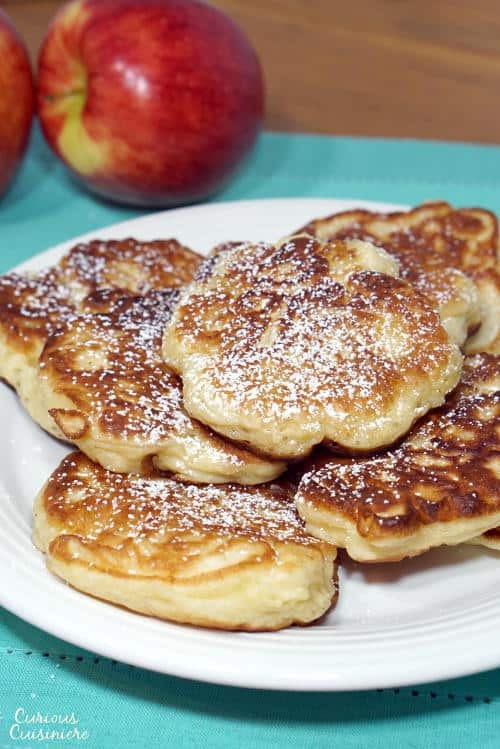 I think jabłkami is quite a fun word to say, but for now, we’ll just call these little pillows of apple delight Polish Apple Pancakes. It is quite unusual to see a pancake recipe that uses yeast. 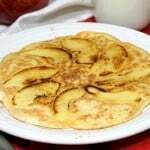 And, you will find many variations of apple pancakes in Poland that don’t use yeast at all. 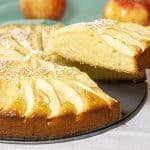 Those versions quite closely resemble what we would think of in the States for “apple pancakes.” However, we were intrigued that some versions called for yeast, and we wanted to give this unique (to us) take on pancakes a try. The yeast in this recipe creates a super thick pancake, that is almost like a cross between a super fluffy pancake and a fritter. The yeast also adds a wonderful depth of flavor that, when paired with the apples, makes theses pancakes so flavorful you don’t really need a topping! Since these yeast raised pancakes do need a little bit of rising time, they don’t make the best early morning breakfast food. Plus, breakfast in Poland is more on the savory side: bread, cheese, cold cuts, etc. So, we weren’t surprised when we found out that it is quite common for racuchy z jabłkami to be served for dinner or a snack. 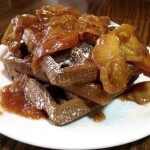 We’re all about pancakes for dinner or as an afternoon snack! And, these pancakes do make the perfect snack. They’re best eaten hot and crispy, nearly right out of the pan. Give them a little dusting of powdered sugar, and that’s all the topping you need. Not a lot of ceremony or meal-time pomp and circumstance, these guys shine all on their own. 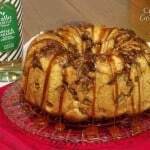 We’re pretty sure your family will be clamoring for Polish apple pancake dinners all the time! The batter for these yeast-raised pancakes need to rise in a warm, draft-free place for 1 - 1 1/2 hours before making your pancakes. In a large bowl, mix together flour, sugar, yeast, and salt. Add the warm milk, egg, and melted butter. Mix until the mixture is moistened; your batter will be thick. Cover the batter and place it in a warm, draft-free place to rise for 1 - 1 ½ hours. Near the end of the rising time, peel, core, and dice the apples. Once the dough has risen, mix in the diced apples. Add enough oil to barely coat the bottom of 12” sauté pan (roughly 1 ½ - 2 Tbsp. Heat the oil over medium high heat, until the oil sizzles when small bit of batter dropped in. 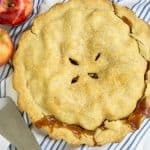 Drop the batter by large spoonful into the hot oil, spreading it out as thin as possible with the thick chunks of apples until you have a roughly 3 inch pancake. Fry the pancakes for 2-3 minutes over medium to medium high heat, until the bottom is golden and the top is just starting to dry out. Then, flip the pancakes and cook on the second side for 2-3 minutes, until golden. Remove the pancakes from the pan to a paper towel lined plate. 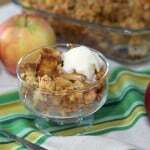 Hi Yvonne, Simple doubling the recipe as written should work for you. Enjoy! HI, thanks for the recipe. 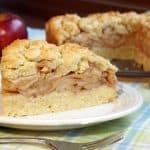 I live in Poland and was looking for a recipe for racuchy in English. I have just made them and they worked well. If I may make a suggestion though, when cooked in oil they can be pretty stodgy. I cooked them with just a smear of butter with a pastry brush in a non-stick pan. 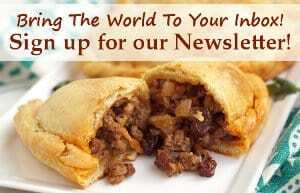 My husband (who is Polish and so has eaten his fair share in his lifetime) said they were the best he had ever had. What a great idea! Thanks for sharing! We’ll have to dry them this way next time! What does one do with the butter? Hi Alexander. We did miss the butter in the instructions. Thank you for catching that! It gets added to the batter with the milk and eggs. (We have updated the recipe.) Enjoy! Thanks Liz! Whatever you call them, the’re still delicious! !